As mentioned in my previous posts, I chose Cultured Code’s Things as my GTD tool. The Mac / iPhone combination makes it really versatile and after about a month of using it, I’m still loving it. Therer are, however, a bunch of improvements required for Things to become truly great. These are the 5 features I consider “must have”s. Everything else would just be “nice to have”s to me as of writing. GTD rests on the principle that a person needs to move tasks out of the mind by recording them externally. That way, the mind is freed from the job of remembering everything that needs to be done, and can concentrate on actually performing those tasks. First off, I have a sh*t ton of information to manage at any given time. I have my job, a bunch of internet stuff going on and I’m part of multiple musical formations, so needless to say it rarely gets boring. I used to be able to manage all my tasks in-brain. However, seems I’ve hit a critical mass these days. Phone didn’t stop ringing, eMails were making my inbox explode and I kinda had the time for none of it that day. When the information rush finally ended, I was sitting there thinking “Hmm.. out of all that mess, what were those 2 things I wanted to do immediately?” — no clue! That’s when I decided I’d need a tool to manage my stuff. After fiddling around a bit, I stumbled upon a Mac OS Application labeled “Things“, by a small company named Cultured Code. It looked pretty much exactly like my always-wanted-to-have task-management-application. Only downside (at the time) I thought was the price. I didn’t really want to spend $40 for it, +$10 for the iPhone version to sync tasks and take them with me on-the-go, which makes us $50 for a task management solution. But maaaan did that application look great. So I decided to let my colleague take a look. He’s the “king of tools” at work and he actually read David Allen’s GTD book, so he was the perfect judge for a first-impression. After watching the “Things” screencast, he was like “Yep, that’s it, it’s almost perfect… If I had a Mac I’d go out and buy it”. After that, I spent several hours browsing through articles and forum posts. I ruled out any solution that would make me send my task data to a third party server like Remember The Milk, I just hate that thought! In the end, the only serious (Mac) alternative to Things seemed to be The Omni Group’s OmniFocus. But supposedly, that one would be less flexible by being bound too tightly to the GTD principles or at least less fun to use than Things. On a side note, OmniFocus is also twice as expensive. That made me reconsider Things’ price as not being too expensive after all. I downloaded the Things for Mac demo and bought the Things iPhone application to be able to test the syncronization, which is epic btw. I’m 5 days into using it and applying general GTD principles now and I really feel like staying on top of my tasks a lot better than before. 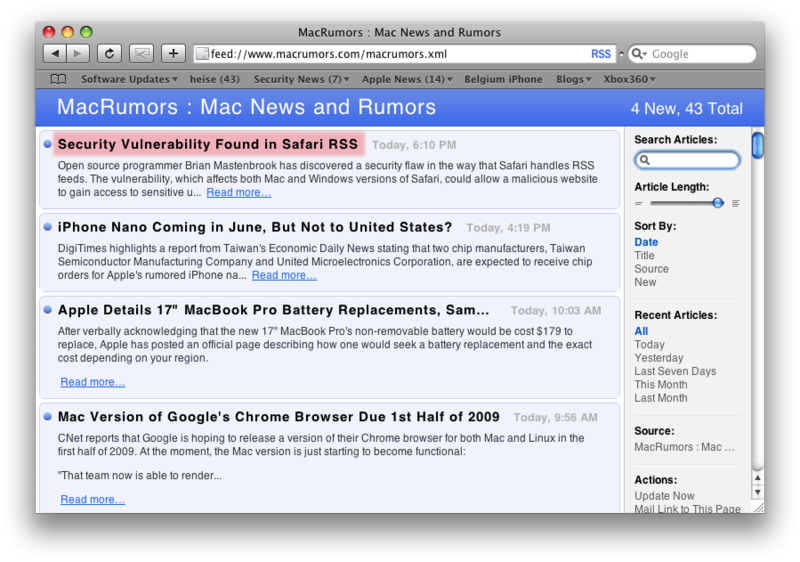 I originally posted this on the macrumors.com forum, so I’ll copy/paste the relevant parts over here. I wonder if you could help me troubleshoot a problem I have with my shared network volume. I have my iMac and PC connected to each other through the ethernet. The iMac is set to read/write the shared network volumes on my PC. The Finder is used to set up the SMB connection. Everything works fine. Mac applications are able to read and write files to the PC. However, after a day or so (during which the PC has been kept on, while the Mac has slept) problems occur. A disk on 'pcxp' is in use and could not be ejected. Try quitting applications and try again. The dock is relaunched but the problem remains, this time with a new process number 97642. When I try to restart my iMac, the desktop will close, and only my wallpaper remains. There, it will remain hung until I do a cold boot. Can anyone figure out what is wrong. It’s pretty annoying to have to reboot my Mac daily. So I *had* exactly the same problem here between my Mac Pro and my XP PC. Same usage pattern (PC stays on, Mac sleeps every night). Fortunately, I only *had* this issue once in about two weeks, but it *was* annoying as hell!! -> yields only the local mounts, no smb mounts whatsoever. -> HANGS, yes it blocks the terminal, tried to kill -9 the umount process without any success!! -> also HANGS the terminal. All of a sudden, the finder flashed a window (had no chance to see what it was) and the previously hanging ls and umount processes were gone! The finder GUI listed the smb shares on the remote server again and everything seems fine again! Ever heard about those incredibly expensive file recovery tools? For recovering photos, documents and all kinda stuff? Since I run Time Machine on my Mac and since I do full backups of my valuable stuff regularly, I was pretty sure I’d never need one of those… until today! Yesterday evening, I took some amazing photos with my Pentax DSLR. The lighting was absolutely perfect and I was looking forward to importing them in iPhoto today. I don’t sync my SD card with iPhoto every time I take a bunch of pictures. I generally wait until I need some pics immediately to copy all the previous ones over to my Mac. So this morning, I wanted to import the current batch of photos from my SD card into iPhoto. Worked as always, except for the photos I took yesterday evening. Out of the dozen or so I took, there was only one left. And that one was corrupted (a bunch of weird horizontal lines within the pic). ALL the others from yesterday were gone. And since I selected “Delete Originals after import”, the SD card was…. empty! Having the exact same conditions as yesterday is unlikely, especially with the f’d up weather here in Belgium. Therefor, I decided to take a look at the file recovery tools out there. Being on a Mac doesn’t help when it comes to finding free niche products. That narrowed down the available tool palette. I ended up taking a look at two tools: LC-Tech’s Photorecovery and Christophe Gernier’s photorec. The former being a commercial tool, I used the demo. The latter is an open source command line tool. First off, I must admit that I don’t use headphones on the iPhone very often and that I carry it in my pocket all the time without a protection case, which may be part of my problem…. But anyway, sitting at work I wanted to listen to something other than this one song I’m looping on YouTube for days now, so I took my iPhone and the earphones. Put them in, iPod app, hit play, song fires up oka…. wow wait what the hack is that strange sound I’m getting here?! Yeh, indeed it was the kind of sound you get when your headphone jack starts to die or isn’t fully plugged in. Basically right and left channels cancel each other out and the only thing left is the difference between them, which is usually some weird reverb’ish sound. Lead vocals are usually gone when that happens and the phase is totally screwed. I was wondering because my iPhone and the earphones are barely half a year old. I started hitting the headphone jack to see if that’s the source of the problem. Bad idea: things got crazy at that point!! I got slammed with loud crack noises killing my ears and the iPhone went all crazy playing and pausing the player continuously till I stopped hitting the connector… WEIRD!! Damn, my iPhone broke!